Yesterday we spent the day at Kidsfest. When we woke up it was raining, but the weather dried up just in time for us to leave--yay! It was the first time attending for all three of us; though I did perform there one year, I never experienced it as a child. We had tickets to see Will Stroet & the Backyard Band at 10:30am, so we hopped on the bikes & zipped there (the quick way, avoiding the seawall) just in time for the show. Sprout loved doing the actions to every song. As it was a bilingual show, he even learned some French when Will was teaching all the kids the words to the exercise song, En haut, en bas. After the show we chatted with Kim (Will's wife & manager), Will & their little daughter Ella. He has just released a new DVD of his songs. If you're looking for some fun kids' music, stay tuned for a giveaway of Will's new DVD on The Sprog! He's playing Kidsfest again on Sunday & there are a few tickets left--it's a really interactive show for kids around two & up. Sprout loved the toys & puzzles. The monkey costume: not so much. Next stop was the Exploration Zone--if you don't manage to get tickets for a show at Kidsfest, this area, as well as the Celebration Zone & the Imagination Zone are accessible for just $6; there's tons to do in there. 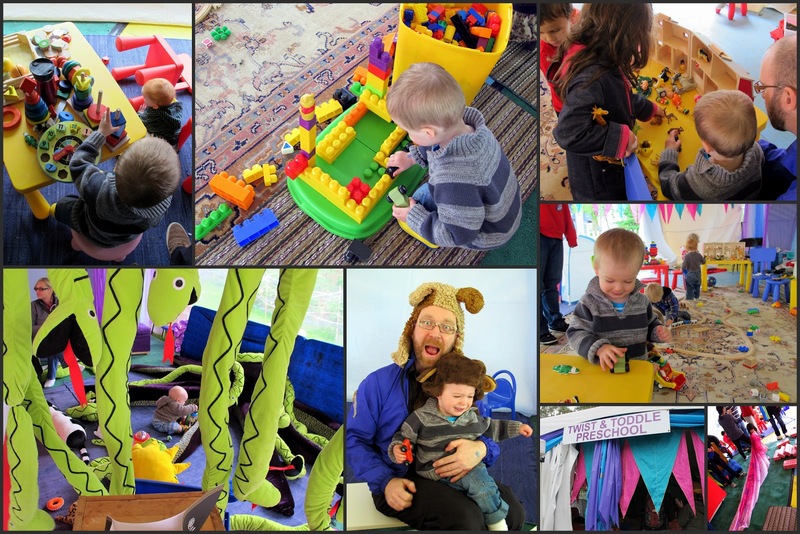 We headed straight for Twist & Toddle, a big carpeted tent for the littlies. It was full of toys: trains, puzzles, little animals, costumes, tents, tunnels, a water table with boats & buckets, as well as a baby zone for the really tiny ones. Sprout didn't want to leave! 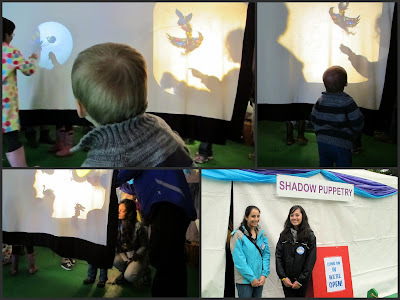 Shadow puppets & two of the MANY volunteers that make Kidsfest possible. We heard that the Shadow Puppetry tent was fun, so we went there next. Sprout enjoyed watching the shadows on the screen in the darkened tent for a few minutes, then we went around back & made some shadows ourselves. He did a little dancing to the music (middle eastern influenced tunes--I recognized a song by Beirut as we were leaving) then we checked out the playground for a while. There were quite a few school groups, so the playground was packed with kids a lot bigger & faster than Sprout. The bucket o' kids swing. By this time it was lunch & we were getting peckish, so we walked over to Railspur Alley to grab some food at Agro Cafe. It was fairly quiet when we arrived, which was a really nice break. They had a Kidsfest Special: three different lunch boxes with sandwich, juice, fruit & another snack. Sprout's 'Elephant Box' had more cheese cubes than he could eat (which is a lot!). We didn't have time to see everything, so I'm looking forward to taking Sprout to Soundscape, an outdoor noise-making extravaganza. Maybe we'll get his face painted if he'll sit still long enough & I'd love to try making a sock puppet at Sock It To Me! What are you planning to do & see at Kidsfest this year? If you like what you read here, please vote for me in the Vancouver Mom Ultimate Blogger contest. Voting closes soon on June 4, 2012. Thanks!